Bridging loans are short-term loans designed to cover a temporary gap in funding. They act as ‘bridge’, providing you with short-term finance to allow you to make a purchase or fund a project until a more permanent solution can be found. Similar to a mortgage, a bridging loan is secured against your property. One of the key difference from a mortgage is that bridging loans can often be arranged within a matter of days, making them the ideal choice when speed is of the essence. One of the most common uses for bridging finance is for homeowners who have found their ideal new home before their old one has sold. A bridging loan can allow them to move ahead with puchasing the new property, then give them time to sell their old property to repay the bridge. Bridging loans come in two forms: open and closed bridge. A closed bridging loan is available to borrowers who have already exchanged contracts for the sale on their current property. It is typically easier to have a closed bridging loan accepted as it is considered less likely that the sale will fall through. Alternatively, an open bridging loan is for borrowers who have already found their ideal property, but have not yet sold their existing property. Due to the nature of these loans, lenders are often more reluctant to offer out open bridging loans, although your chances of acceptance will be increased if you own a lot of equity in your current property. Whilst a bridging loan offers you a fast and convenient cash flow solution that can be used for almost any purposes, they also often charge a high rate of interest. Consequently, before applying for these types of loans you should ensure that you conduct considerable research into the market to consider all of the funding options available. 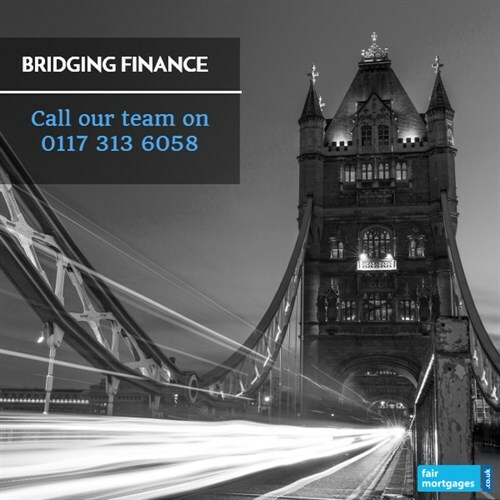 Exclusive bridging loan rates – We provide you with exclusive bridging loan rates that you will not find on the high street. Whole of market Service – We compare all deals from all of the top lenders in the market so you do not have to. To find out more call Fair Mortgages today on 0117 313 6058 or alternatively, complete our call back request form. Get there first – a bridging loan can help you beat the competition and secure a property before you have even sold your own home, and before another buyer snaps it up. Purchase a property at auction – a bridging loan can provide you with the capital required to secure a property on the day of the auction. Development finance – If you are planning on purchasing property for redevelopment purposes, a bridging loan can provide finance to help get the project off the ground.